Did you miss your local genealogical society meeting this month? Fountaindale Public Library’s newest Genealogy Club meeting is live and available for free through December 15, 2018. This month’s meeting “Lineage Societies: What are they? Why Would I Join One? How Do I Join?" 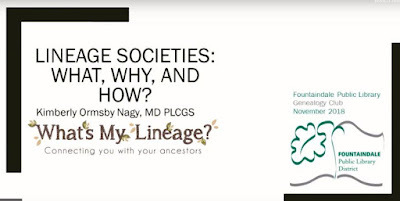 is presented by Kimberly Nagy from 'What's My Lineage?'. Kimberly will help you navigate the requirements and application process for most of the major US lineage societies, as well as how these groups can assist you further your research. Looking to heat up your research this winter? Add our collection of free webinars to your genealogical 'to do' list! And while you're visiting our site, don't forget to subscribe to our blog for interesting research articles, updates on future programs, webinar information, and other special projects. For more details visit http://fountaindalegenealogy.org.